Hotel Roda Al Bustan, Dubai, United Arab Emirates - Lowest Rate Guaranteed! With a stay at Roda Al Bustan in Dubai (Garhoud), you'll be within a 5-minute drive of City Centre Deira and Dubai Creek. 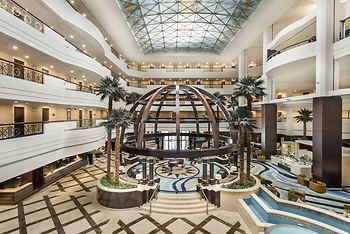 This 5-star hotel is 3.1 mi (4.9 km) from Dubai Festival City Mall and 3.7 mi (5.9 km) from BurJuman Mall. We were upgrade when we checked in and were told it was complimentary, on checkout we were charged for the upgrade and because we had to catch an early flight we did not have the time to discuss this. So we paid it and left. Also the room was setup for a single person, when I booked the hotel I clearly stated it was for two people, for example only 1 bathrobe, 1 set of slippers. Why is there still only 1 bathrobe and 1 pair of slippers in a double room for double occupancy??? This was the case last time we were there and I asked about it then. Nothing has changed still. that is a bit of a shame. Everything was much as I expected - however the staff, without exception, were extremely polite, helpful and smartly turned out: full marks to every single one of them. Extremely polite and cheerful staff. A well equipped gym. In the bathroom, the taps on the basin turn in different directions: very annoying. JUST SORRY THAT DUE TO MY BUSINESS APPT. I HAD TO CHECK OUT EARLY MORN AND COULD NOT TAKE ADVANTAGE OF 18.00 CHECK OUT. One of the best hotels I ever stayed in. The piano player, in the mittle of the hall during daytime. It was very difficult to find a place to have a meeting because of the piano. During the evening it was okay. This hotel provided excellent customer service and was very accommodating. The location was great. Great value for the money! First class service. I will definitely use hotel during my next stopover.